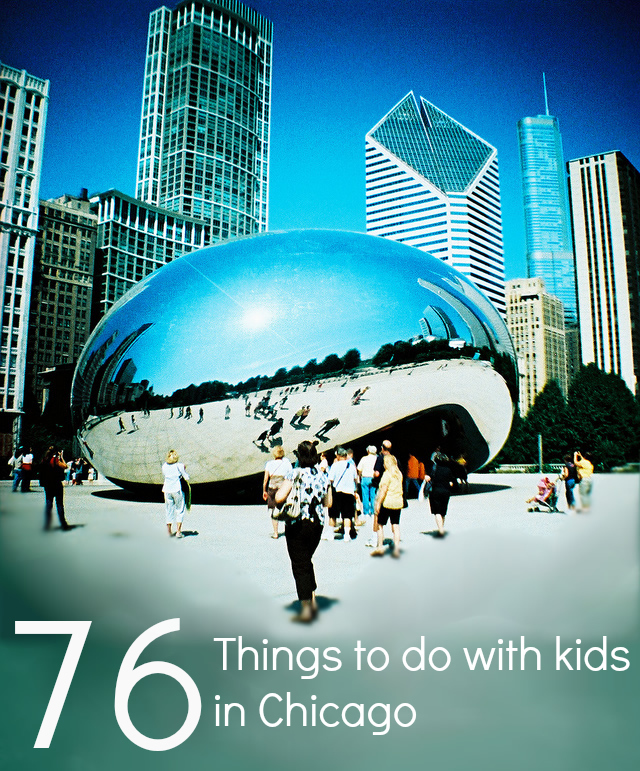 Looking for things to do in Chicago with kids? We have a mega list with 76 fun things you can do around Chicago! The kids will love it! An Urban Oasis, located on the south side of Chicago. One of the largest and most stunning conservatories in the nation. Founded in 1857 to give scientists and nature aficionados a place to study and share the specimens they collected. A leader in animal conservation and care. A Chicago Landmark building that houses the city’s official reception venue where the Mayor of Chicago has welcomed Presidents and royalty, diplomats and community leaders. Awesome place to visit, and it is very high which provides amazing views all around. Family Cafe and Imaginative Indoor Playground for Kids in Chicago. An indoor Chicago Playroom aimed at children 6 weeks to 6 years. Fun for all ages in our private, indoor arenas with gigantic inflatables. A hot dog stand in the Lincoln Park neighborhood of Chicago, Illinois. Excellent in their music, the decor, and the service. Try your afternoon tea here. A drive-in hot dog stand with carhop. Excellent $5 pancakes cannot be beat. A flagship McDonald’s restaurant located in Chicago. Mexican food simple tastes done well. The greatest southern fried Chicken. Home of the famous deep-dish pizza tastes the same as it did back then. An urban dining venue with 14 distinctive kitchens that serve real food made from scratch daily. Offers cheesecakes in a variety of flavors, baked in Chicago. Quirky servers in serve up great burgers, hot dogs, homemade chili, fries, salads, milkshakes, and ice cream sundaes with a side order of sass! Not only do they have extremely tasty food, their service is magnificent. The world’s premier comedy club/theatre and school of improvisation. A Tony Award-winning Chicago theatre company founded in 1974. Enjoy Shakespeare’s famous plays at Navy Pier’s Chicago Shakespeare Theater. Organization serving as a local and national resource for teaching, performing and celebrating folk music, art and culture from all countries. Dinner theatre featuring horseback performances of The Nutcracker, Legend of Sleepy Hollow and Quadrille. Take classic children’s stories and turn them into colorful new tales. A favorite Labor Day Weekend tradition. Runs from June 20-23 in Bronzeville and downtown. Enjoy 20 hours of live country music at Chicago Country Fest! The largest free blues festival in the world and remains the largest of Chicago’s Music Festivals. Enjoy children’s theater, plays, musicals and other performances. Teaches creative writing workshops in Chicago Public Schools, and adapts the children’s writing into dynamic pieces of theater. A place to experience artistic beauty in an upbeat yet laid-back environment. Enjoy a home cooked meal away from home. A 3,300-foot long pier on the Chicago shoreline of Lake Michigan. Great little bookstore and children oasis. Been showing classic films in Chicago’s Grant Park for 10 years. One of Great Food Tours delicious walking tours. The most venerable and polished of the tour-and-activity sites. Museum houses more than 300000 works of art and includes among its treasures, American Gothic by Grant Wood. Collects, exhibits, and interprets art created since 1940 in all media and preserves it for future generations. Families play & learn together on 3 floors of fun. Social and educational services, including program for children with storytelling, performance, and craft projects to introduce them to the Native American way. Sits on Lake Shore Drive next to Lake Michigan, part of a scenic complex known as the Museum Campus Chicago. America’s first planetarium and a premiere resource for inspiring the next generation of space explorers. The nation’s premier outdoor food festival showcasing the diversity of Chicago’s dining community. Ideal for beginners and experienced riders, residents of Chicago. Sells locally farmed products in Chicago. Chicago’s 26 miles of public beaches offer the perfect settings for playing, relaxing and soaking it all in. Top the perfect romantic weekend in Chicago by treating yourself and your significant other to a horse carriage ride through downtown Chicago. One of Chicago’s most popular indie bookstores. One-of-a-kind toy store that has been established for over two decades. A hip, online style shop for cool baby clothes, kids clothing, baby gifts, personalized baby and kids tees and toys. A boutique featuring the finest in childrens couture. Create your very own Teddy Bear and other stuffed animals at the Build-A-Bear Workshop. A premiere lifestyle brand that offers a variety of age-appropriate, high-quality dolls, books, clothing, and accessories. A professional basketball team based in Chicago. Offers award-winning, original tours of Chicago for a variety of interests, ages, and fitness levels. Totals 8.51 acres and the park offers an athletic field, playground equipment, a small recreation building, a spray pool, and horse shoe, tennis, and basketball courts, and an interactive water spray feature offers community children relief from Chicago’s hot summers. Provide children a refreshing way to cool off on a hot summer day. Provides a playground, a putting green, horseshoe and tennis courts. 3.1 acres and features two multi-purpose clubrooms. Enjoy this water playground with the family.